Frances Fitzgerald is at the heart of a government crisis as it was revealed she failed to disclose an important email. OPPOSITION PARTIES ARE calling for a series of documents given to Fianna Fáil leader Micheál Martin by Taoiseach Leo Varadkar which outline Department of Justice correspondence in relation to Fitzgerald’s knowledge of a garda legal strategy against McCabe to be made available to all parties. Varadkar and Martin met last night to try to solve the impasse between the parties as Fianna Fáil seek to force Tánaiste Frances Fitzgerald into stepping down after it was revealed this week that she ignored an email sent to her in May 2015 regarding garda whistleblower Maurice McCabe. Yesterday’s meeting between the two leaders was said to have produced “a good exchange of views”, however, it’s still uncertain whether Fianna Fáil will be willing to call off their motion of no confidence. Last night, the Irish Independent revealed that Varadkar handed over a series of Department of Justice documents to Martin. Labour Party leader Brendan Howlin has called for the batch of documents to be provided to all parties, and that clarity is needed to as to whether these have also been provided to the Disclosures Tribunal. Varadkar requested records of the department’s correspondence when it was revealed last week that Fitzgerald failed to disclose that she had received the email. “At the heart of this controversy is the failure to answer questions in an honest, straight-forward manner. This correspondence should now be released to avoid further controversy,” Howlin said. Labour’s Alan Kelly has backed Howlin’s calls this morning sand said that it is vital that the documents are given to opposition parties today. He has put forward numerous Parliamentary Questions over the past few months requesting correspondence with Department of Justice in relation to the legal strategy. His requests have all come to no avail. The fact that only the leader of Fianna Fáil has been given access to documents by the Taoiseach makes a mockery of our democratic institutions. “The fact that this information has been provided by Deputy Martin to try stop an election, despite the fact that I have asked over twenty Parliamentary Questions on this issue, is an affront to democracy,” Kelly said. Sinn Féin spokesperson for justice Donnchadh Ó Laoghaire TD also called for the documents to be released. “These papers, if they can be shared with one member of the opposition, should be shared amongst the whole opposition. It makes a mockery of our democratic institutions to do otherwise,” Ó Laoghaire said. Aside from the growing tension surrounding the disclosure of documents, The Sunday Business Post revealed today that Fitzgerald attended an event with the then Garda Commissioner Noirín O’Sullivan the day after she received the email. Fitzgerald did not discuss the contents of the email with O’Sullivan on that occasion. Subsequent to the calls for the documents to be released, it’s also been revealed that former Garda Commissioner Noiríin O’Sullivan contacted the Department of Justice to inform the department of a dispute at the O’Higgins Commission at about the time of Maurice McCabe’s cross-examination. This contact was reported by RTÉ’s This Week programme which also said that Fitzgerald was not made aware of the contact between O’Sullivan and a senior department official. Over the past number of days as the crisis continued to escalate, Varadkar has stood firm on his support of Fitzgerald. Speaking at the opening of FemFest yesterday morning, Varadkar said Fitzgerald has “done nothing wrong”. On Friday, he said that he would not throw Fitzgerald under the bus. Varadkar has also warned that if Fitzgerald does not step down by Tuesday that a general election is imminent. He did not rule out accepting Fitzgerald’s resignation if it was offered. I think there’s a real injustice here in people calling her to resign in these circumstances. There have been suggestions that Fitzgerald may temporarily step aside until the new year when the Charleton Tribunal could discuss the matter. I think the Tánaiste stepping aside in reality is a resignation. The Tánaiste will then have an opportunity to go then after that, if she did resign, to the Disclosures Tribunal. If Fitzgerald doesn’t step down and if Fianna Fáil follows through with the no-confidence motion, the confidence and supply agreement ends and the government loses its majority vote in the Dáil. Yesterday morning, Sinn Féin president Gerry Adams said that regardless of what Fianna Fáil does, Sinn Féin will go ahead with its motion of no confidence next week. Adams said the only thing that will prevent this is the Tánaiste stepping down. “There is a dysfunctionality at the heart of this government. Frances Fitzgerald, as Minister should have intervened,” Adams said. Losing a majority guarantees a general election. If the parties stick to their guns, the only way an election could be avoided now is if Fitzgerald resigns. 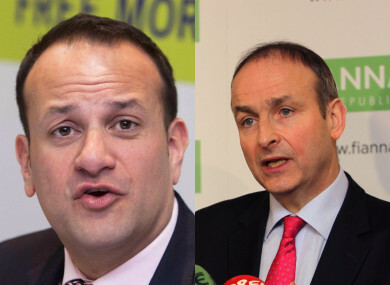 Varadkar has said if this was to happen his preference would be an election before Christmas. Email “'A mockery of our democracy': Pressure increases on Varadkar to make Dept of Justice docs public”. Feedback on “'A mockery of our democracy': Pressure increases on Varadkar to make Dept of Justice docs public”.